Download "2015 Medicare Physician Fee Schedule Final Rule Summary"
3 staff, who need not be direct employees of the billing physician as long as the staff are under the general supervision of the billing physician and all other requirements of the incident to regulations are met. Providers of CCM services must utilize EHRs or another health IT platform that include an electronic care plan, which is accessible to all providers within the practice, including those providing care outside of normal business hours and shared with care team members outside of the practice. 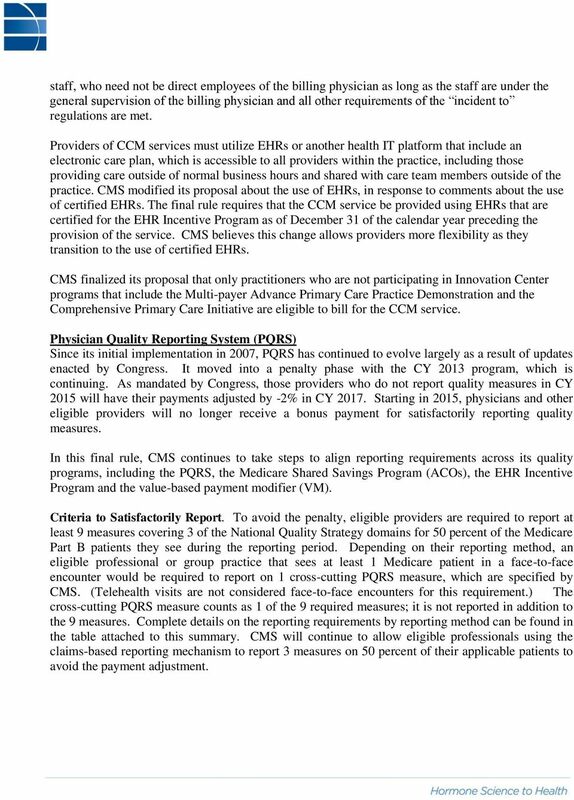 CMS modified its proposal about the use of EHRs, in response to comments about the use of certified EHRs. 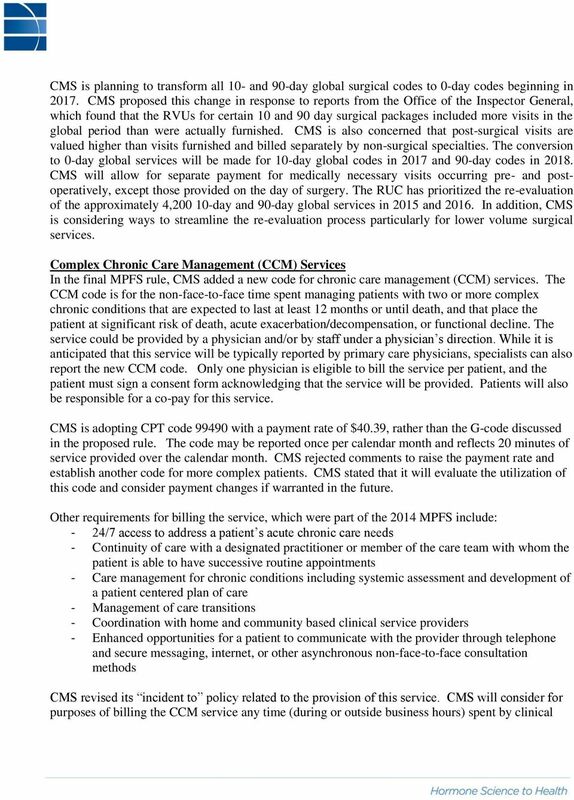 The final rule requires that the CCM service be provided using EHRs that are certified for the EHR Incentive Program as of December 31 of the calendar year preceding the provision of the service. CMS believes this change allows providers more flexibility as they transition to the use of certified EHRs. CMS finalized its proposal that only practitioners who are not participating in Innovation Center programs that include the Multi-payer Advance Primary Care Practice Demonstration and the Comprehensive Primary Care Initiative are eligible to bill for the CCM service. Physician Quality Reporting System (PQRS) Since its initial implementation in 2007, PQRS has continued to evolve largely as a result of updates enacted by Congress. It moved into a penalty phase with the CY 2013 program, which is continuing. 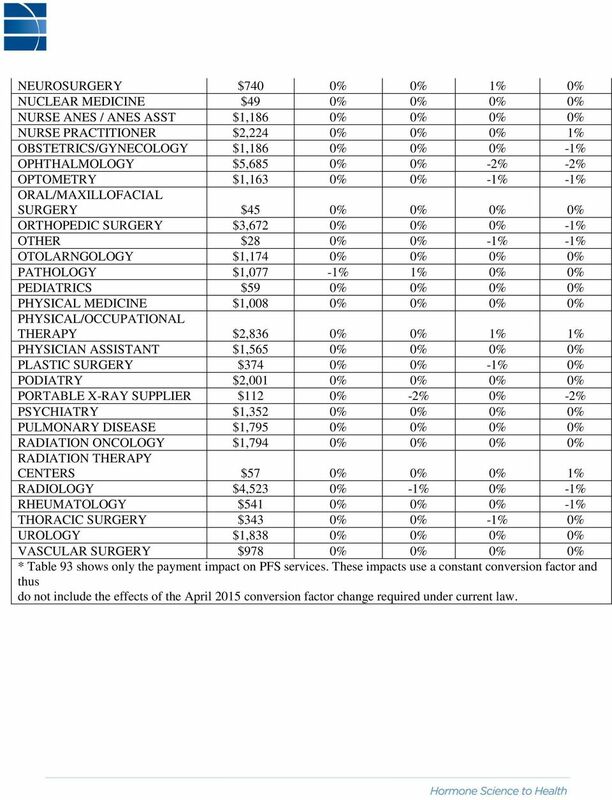 As mandated by Congress, those providers who do not report quality measures in CY 2015 will have their payments adjusted by -2% in CY Starting in 2015, physicians and other eligible providers will no longer receive a bonus payment for satisfactorily reporting quality measures. In this final rule, CMS continues to take steps to align reporting requirements across its quality programs, including the PQRS, the Medicare Shared Savings Program (ACOs), the EHR Incentive Program and the value-based payment modifier (VM). Criteria to Satisfactorily Report. To avoid the penalty, eligible providers are required to report at least 9 measures covering 3 of the National Quality Strategy domains for 50 percent of the Medicare Part B patients they see during the reporting period. Depending on their reporting method, an eligible professional or group practice that sees at least 1 Medicare patient in a face-to-face encounter would be required to report on 1 cross-cutting PQRS measure, which are specified by CMS. (Telehealth visits are not considered face-to-face encounters for this requirement.) The cross-cutting PQRS measure counts as 1 of the 9 required measures; it is not reported in addition to the 9 measures. Complete details on the reporting requirements by reporting method can be found in the table attached to this summary. CMS will continue to allow eligible professionals using the claims-based reporting mechanism to report 3 measures on 50 percent of their applicable patients to avoid the payment adjustment. 4 Note that all groups of 100 or more eligible professionals are required to report the Consumer Assessment of Healthcare Providers and Systems (CAHPS) survey. It remains optional for groups under 99 eligible professionals. Quality Measures. It is statutorily mandated that measures must be endorsed by the National Quality Forum or entities under contract with NQF. But, CMS will consider measures not NQFendorsed when no endorsed measure in an area exists. In addition, CMS will not restrict the type of organizations that can develop quality measures and there are no requirements for measure development. 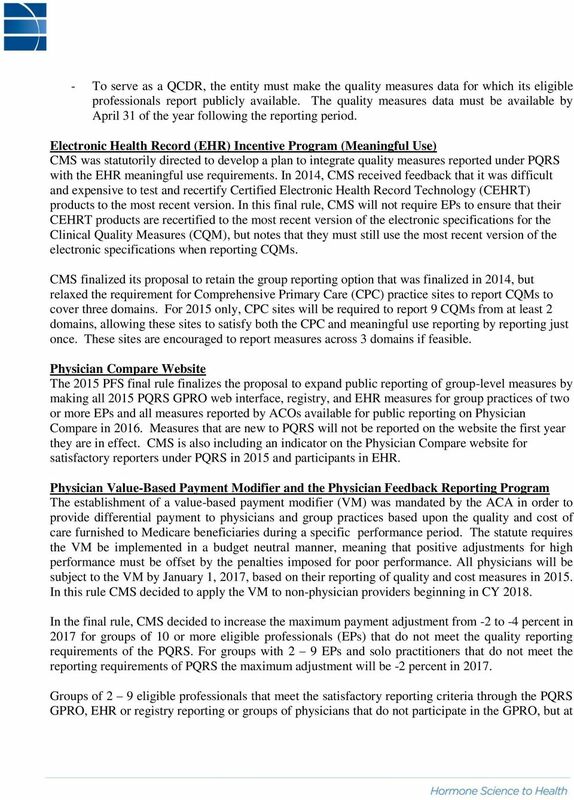 For 2015, CMS added 20 new individual measures and 2 measures groups and removed 50 measures. For 2015, PQRS includes 255 individual measures. All proposed measures have been classified into 1 of 6 domains based on the National Quality Strategy s six priorities: 1. Patient Safety 2. Person and Caregiver-Centered Experience and Outcomes 3. Communication and Care Coordination 4. Community/Population Health 5. Efficiency and Cost Reduction 6. Effective Clinical Care Other major changes to the PQRS program in the rule include: Physicians practicing in critical access hospitals (CAHs) will be able to participate in the PQRS for the first time in CY 2015 using all of the available reporting mechanisms. All practices with 25 or more eligible professionals must report quality measures on 248 patients. This reduces the required number of patients from 411 for groups of 100+ eligible professionals and raises the required number of patients by 30 for practices between eligible professionals. Most reporting options require eligible professionals to report on 1 measure from the new crosscutting measures set. PQRS continues to provide eligible professionals with reporting mechanism options. The program retained the claims, registry, qualified clinical data registries (QCDRs), EHR, administrative claims, the GPRO web-interface, and the CAHPS survey. Last year CMS introduced reporting through qualified clinical data registries. CMS has changed the requirements for this reporting method. They are as follows: - To avoid the penalty, eligible providers must report on at least 2 outcome measures. If less than 2 are available, they must report on at least 1 outcomes measures and at least 1 of the following types of measures: resource use, patient experience of care, or patient safety or efficiency/appropriate use. 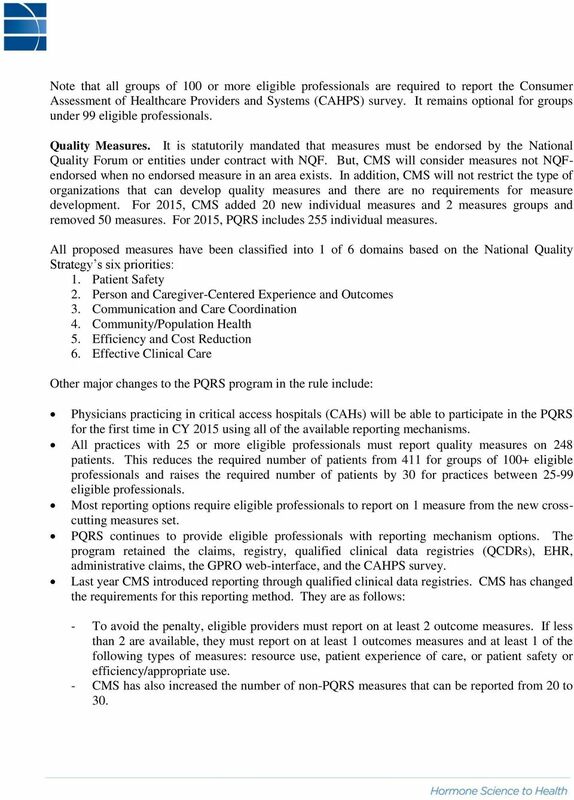 - CMS has also increased the number of non-pqrs measures that can be reported from 20 to 30. 6 least 50 percent of the eligible professionals billing under the group meet the PQRS satisfactory reporting criteria or satisfactorily participate in a PQRS clinical quality data registry will avoid the payment adjustment. 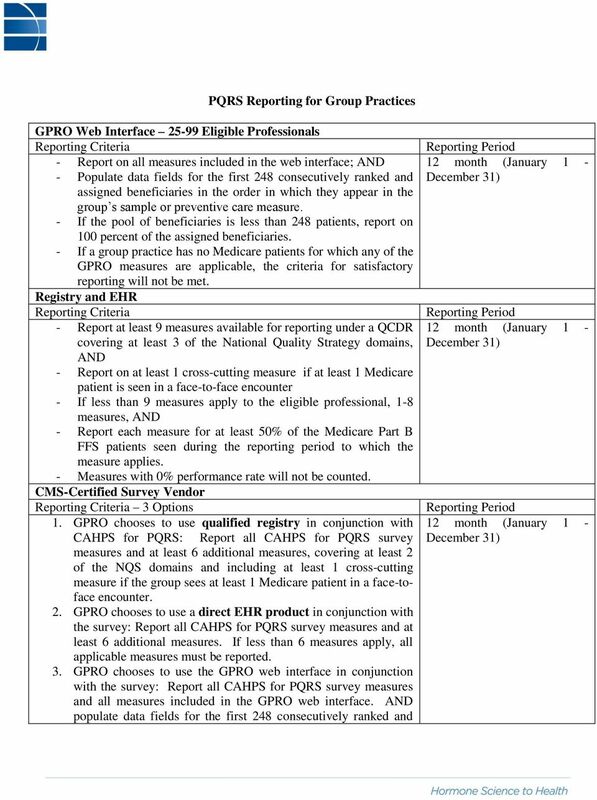 Groups of 10 or more EPs that meet the PQRS reporting requirements will be subject to quality tiering. CMS increased the downward adjustment to -4 percent and the potential upward adjustment to +4 percent for groups in this category. Quality tiering is the analysis used to determine the type of adjustment (upward, downward or neutral) and the range of adjustment based on performance on quality and cost measures. Quality tiering will determine if a group practice s performance is statistically better, the same, or worse than the national mean. CMS establishes composite scores based on performance, one reflecting quality of care and the other cost. The quality of care composite is based on PQRS performance. Total per capita costs plus specific cost measures will be weighted equally to compute the cost composite. Beginning with CY 2017, CMS will apply the VM to all eligible professionals participating in Accountable Care Organizations (ACOs) under the Medicare Shared Savings Program. CMS will continue to provide annual Quality and Resource Use Reports (QRURs) to EPs as a method of providing feedback on the quality and cost of care furnished to Medicare beneficiaries. Open Payments Program (Sunshine Act) The Open Payments program requires drug and device manufacturers to annually report information on payments or other transfers of value made to physicians and teaching hospitals. While separate implementing regulations were published in February 2014, CMS included proposed changes to its open payments program in the MPFS proposed rule. 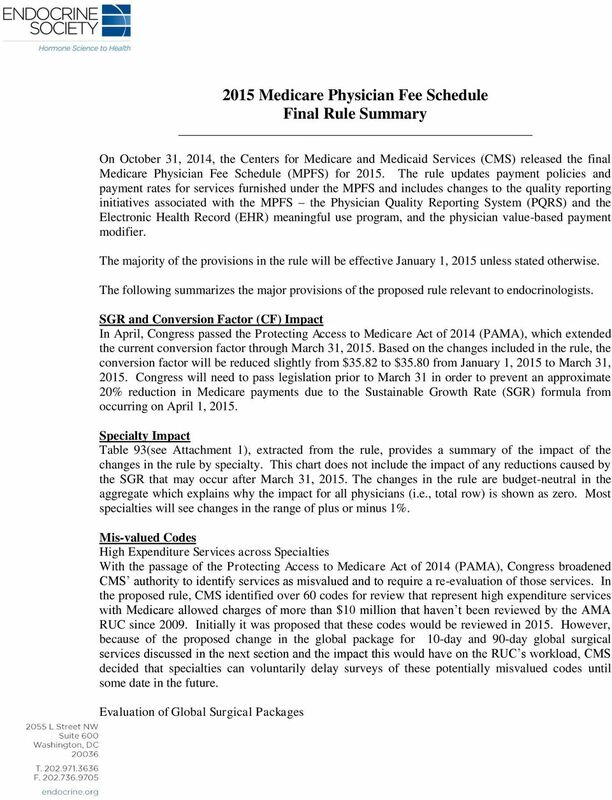 CMS finalized several proposals from the proposed rule, including: 1. The deletion of the definition of covered device as it is duplicative of the definition of covered drug, device, biological or medical supply which is already defined in regulation. 2. A requirement that the marketed name and therapeutic area or product category of the related covered drugs, devices, biologicals, or medical supplies be reported, unless the payment or other transfer of value is not related to a particular covered or non-covered drug, device, biological or medical supply. 3. Applicable manufacturers will have to report stocks, stock options or any other ownership interest as distinct categories. In addition, CMS deleted the current exclusion for reporting transfers of value to speakers or attendees at Continuing Education events. 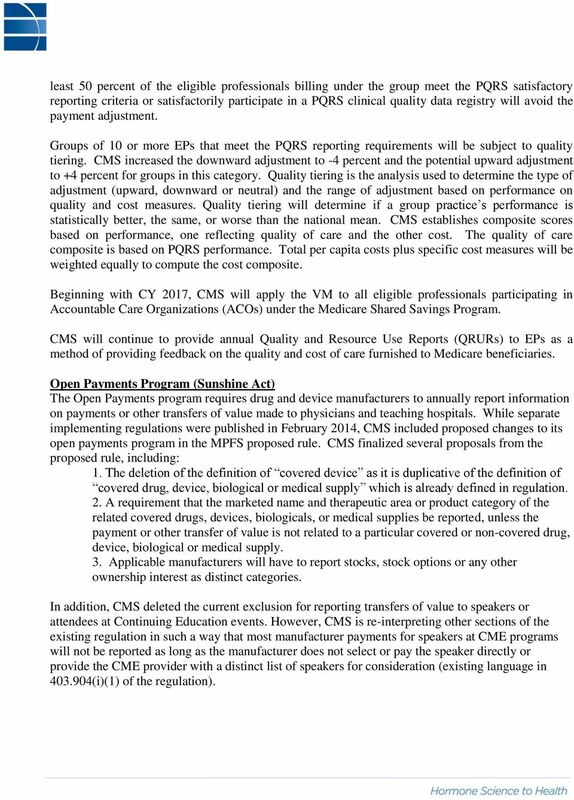 However, CMS is re-interpreting other sections of the existing regulation in such a way that most manufacturer payments for speakers at CME programs will not be reported as long as the manufacturer does not select or pay the speaker directly or provide the CME provider with a distinct list of speakers for consideration (existing language in (i)(1) of the regulation). 7 CMS suggests that payments for physicians to attend CME events also will not be reportable if the manufacturer did not know the identity of the physician attendees beforehand. However, CMS states that it will provide sub-regulatory guidance specifying tuition fees provided to physician attendees that have been generally subsidized at continuing education events by manufacturers are not expected to be reported. 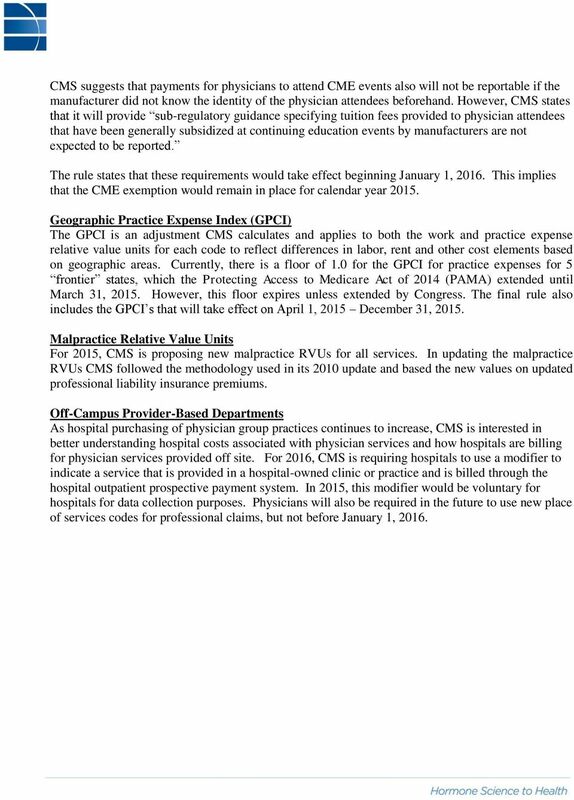 The rule states that these requirements would take effect beginning January 1, This implies that the CME exemption would remain in place for calendar year Geographic Practice Expense Index (GPCI) The GPCI is an adjustment CMS calculates and applies to both the work and practice expense relative value units for each code to reflect differences in labor, rent and other cost elements based on geographic areas. Currently, there is a floor of 1.0 for the GPCI for practice expenses for 5 frontier states, which the Protecting Access to Medicare Act of 2014 (PAMA) extended until March 31, However, this floor expires unless extended by Congress. The final rule also includes the GPCI s that will take effect on April 1, 2015 December 31, Malpractice Relative Value Units For 2015, CMS is proposing new malpractice RVUs for all services. In updating the malpractice RVUs CMS followed the methodology used in its 2010 update and based the new values on updated professional liability insurance premiums. Off-Campus Provider-Based Departments As hospital purchasing of physician group practices continues to increase, CMS is interested in better understanding hospital costs associated with physician services and how hospitals are billing for physician services provided off site. For 2016, CMS is requiring hospitals to use a modifier to indicate a service that is provided in a hospital-owned clinic or practice and is billed through the hospital outpatient prospective payment system. In 2015, this modifier would be voluntary for hospitals for data collection purposes. Physicians will also be required in the future to use new place of services codes for professional claims, but not before January 1, 2016. 9 NEUROSURGERY $740 0% 0% 1% 0% NUCLEAR MEDICINE $49 0% 0% 0% 0% NURSE ANES / ANES ASST $1,186 0% 0% 0% 0% NURSE PRACTITIONER $2,224 0% 0% 0% 1% OBSTETRICS/GYNECOLOGY $1,186 0% 0% 0% -1% OPHTHALMOLOGY $5,685 0% 0% -2% -2% OPTOMETRY $1,163 0% 0% -1% -1% ORAL/MAXILLOFACIAL SURGERY $45 0% 0% 0% 0% ORTHOPEDIC SURGERY $3,672 0% 0% 0% -1% OTHER $28 0% 0% -1% -1% OTOLARNGOLOGY $1,174 0% 0% 0% 0% PATHOLOGY $1,077-1% 1% 0% 0% PEDIATRICS $59 0% 0% 0% 0% PHYSICAL MEDICINE $1,008 0% 0% 0% 0% PHYSICAL/OCCUPATIONAL THERAPY $2,836 0% 0% 1% 1% PHYSICIAN ASSISTANT $1,565 0% 0% 0% 0% PLASTIC SURGERY $374 0% 0% -1% 0% PODIATRY $2,001 0% 0% 0% 0% PORTABLE X-RAY SUPPLIER $112 0% -2% 0% -2% PSYCHIATRY $1,352 0% 0% 0% 0% PULMONARY DISEASE $1,795 0% 0% 0% 0% RADIATION ONCOLOGY $1,794 0% 0% 0% 0% RADIATION THERAPY CENTERS $57 0% 0% 0% 1% RADIOLOGY $4,523 0% -1% 0% -1% RHEUMATOLOGY $541 0% 0% 0% -1% THORACIC SURGERY $343 0% 0% -1% 0% UROLOGY $1,838 0% 0% 0% 0% VASCULAR SURGERY $978 0% 0% 0% 0% * Table 93 shows only the payment impact on PFS services. These impacts use a constant conversion factor and thus do not include the effects of the April 2015 conversion factor change required under current law. 12 assigned beneficiaries in the order in which they appear in the group s sample for each module or preventive care measure. 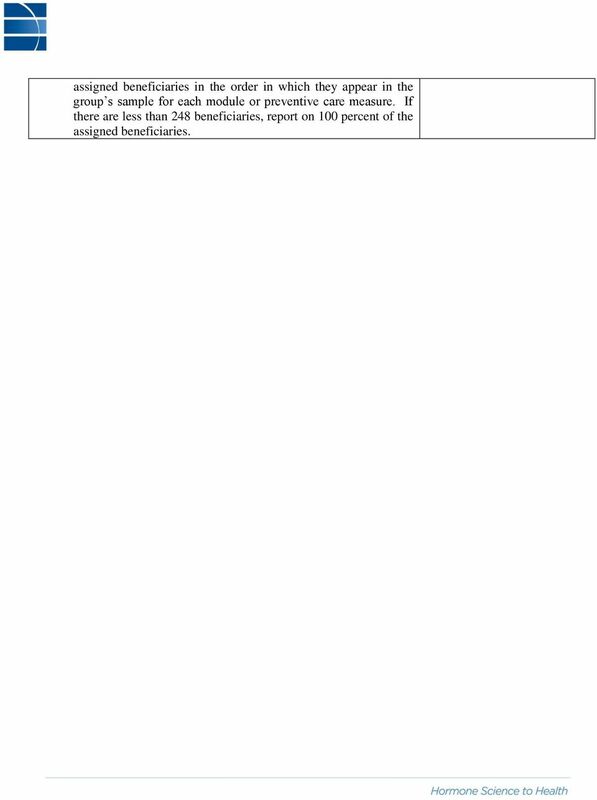 If there are less than 248 beneficiaries, report on 100 percent of the assigned beneficiaries. Clinical Quality Measures (CQMs) What are CQMs? This was also to include nurse practitioners and physician assistants as of 2017 though CMS has decided to delay moving to NPs and PAs until 2018. 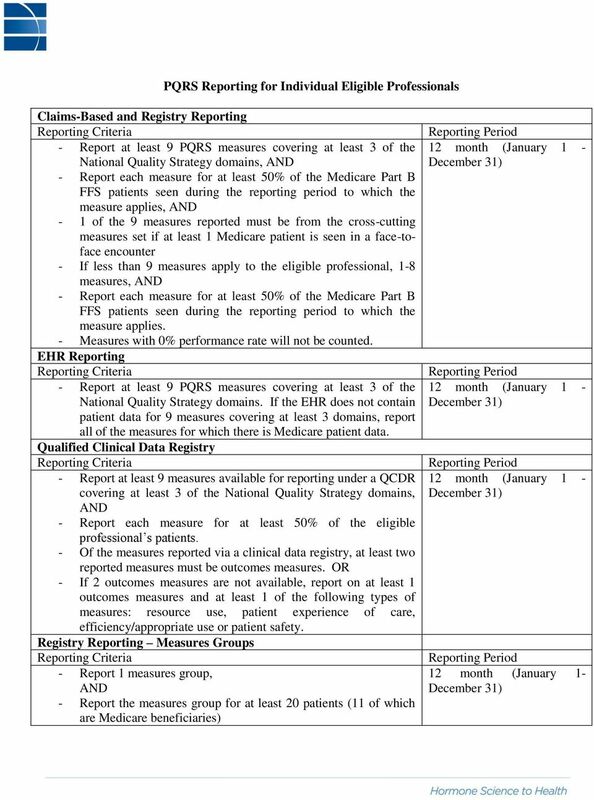 January 2014 Physician Quality Reporting System (PQRS): What s New for 2014 Purpose This fact sheet includes important information about changes to the Physician Quality Reporting System (PQRS) for 2014. Overview of the Development and Implementation of CAHPS for ACOs and PQRS. Sandra Adams, RN, BSN Lauren Fuentes, MPH. CMS SPECIALTY CODES/HEALTHCARE PROVIDER TAXONOMY CROSSWALK. 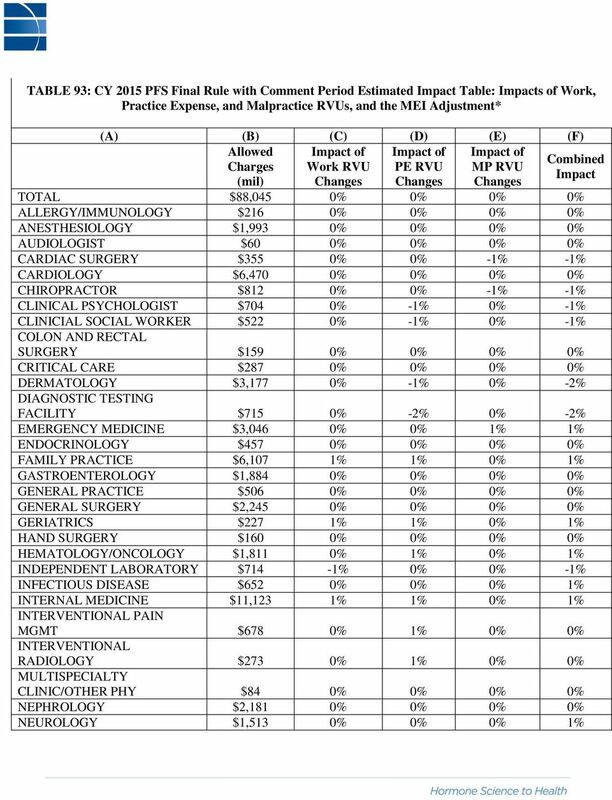 This table reflects Medicare Specialty Codes as of April 1, 2003. Welcome The AAMC, UHC and FPSC Web Conference on 2014 PQRS Proposed Changes will begin shortly. Welcome The AAMC, UHC and FPSC Web Conference on 2014 PQRS Proposed Changes will begin shortly. Please do not place your phones on hold. If you need to leave the event, hang up and dial back into the conference. DRAFT. Select VHA ENTERPRISE STANDARD TITLE:?? Daniel F. Gottlieb, Esq., Partner, McDermott Will & Emery, Chicago Scott A. Weinstein, Esq., Associate, McDermott Will & Emery, Washington, D.C.
Health Care Financing: ACC/ ACO s, beyond the hype hope. Brian Seppi, MD, President, Washington State Medical Assn. Farzad Mostashari, MD, ScM National Coordinator for Health Information Technology Department of Health and Human Services Office of the National Coordinator for Health Information Technology Hubert H.
MEDICARE EHR: PREPARING FOR 2015. Community Counts Practice Effectiveness Web Series ION June 26, 2014 Risë Marie Cleland Oplinc, Inc.